I have a new favourite picture book. Seriously! It's Birdsong, written and illustrated by Ellie Sandall, and published by Egmont UK, 2010. I was dusting the bookshelves where my to-be-read pile lurks, when my hand slipped, the book fell open, and I was drawn immediately into a beautiful fantasy. I plonked myself down next to the bookcase, read it, then read it again. Sandall has kept to minimal, yet meaningful text to produce a picture book that children and adults will love. Her birds are bursting with personality, and each has its own unique call. This is an excellent story to read aloud. I can just imagine most littlies will have it off by heart very soon because of a combination of the bird noises and simple rhyming text. It's also a great book for students studying visual literacy. The art work just zings off the page. I think kids will enjoy experimenting with collage, crayon and watercolour to try to imitate and innovate on Sandall's style. What struck me immediately about Birdsong is its potential for performance. It's perfect as a book to read aloud to a group of children, then work together with them to develop a Reader's Theatre. (You can link to my articles about Reader's Theatre 1,and Reader's Theatre 2 and I have three more articles coming soon). The style of the illustrations will definitely inspire young artists to create their own birds, and these would make a wonderful backdrop for your performance. Children will enjoy creating their own soundscapes with bird calls, or you could add another dimension by including movement and body percussion. Have you ever noticed how youngsters love books with noises they can imitate? Birdsong will be a definite hit with them, I'm sure. I predict some teachers and parents will wish their students had volume buttons. There's also a nice subtle lesson in the book, reminding us that it's not always the biggest and loudest who succeed! Grab Birdsong soon if you want a picture book with fun text, gorgeous illustrations, and an inspiring theme. 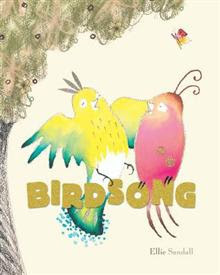 http://bit.ly/bmuDkX Latest book Chook post: Book Review, Birdsong What a stunning picture book! Chuckle, I think you change favourite books about as often as I do!! I must admit though that Birdsong sounds just lovely. I'll keep an eye out! Yes, it's a standing joke around here. But they truly are all favourites. That's why I find it so hard to choose when people ask for top tens etc. It changes constantly! Ellie, how wonderful that you could drop by! I looked for your website online but couldn't find it, nor did I have your contact details, so I am glad your friend could notify you about the review. And thank you for the feedback on performance - I now have such a fun mental picture of you and your "birds" flying around the school! I predict you will love it, Kelly.